Letters to Norah // 25 Months — HELLO, NORAH. March was hard, sweet girl; your birthday and heaven day completely knocked the wind out of me. Maybe it’s because last year we were still raw from mom’s death or because last year it was simpler to create space to honor those big days, but this year was different. This year was harder. This year I held your little sister in my arms as the tears rolled down my cheeks and staring back at me was everything we had prayed, pleaded, and begged God to allow you to have: life. Watching Lora learn and grow has caused me to miss you in a whole new way. Not only did we lose you as the 5 day old beautiful girl you were, but we also lost the 6-week, 1 year, 8 year, and 20 year-old that you could have been. This new longing involves sitting with a lot of wonder. Wondering what color your eyes would have been, if you would have loved our morning family snuggles, what your voice would have sounded like, or how fast you would have grown. What you would have been like as a big sister; would you have been gentle and sweet, or wild and spunky? That’s part of why your big days were harder this year; my heart was experiencing some growing pains in this process of figuring out how to love and honor you well while also taking care of your sister. One of the ways we honored you this past month was by selling shirts to raise money for Love, Norah. Sweetheart, you never cease to amaze me with your ability to inspire people to come together and support families like ours. 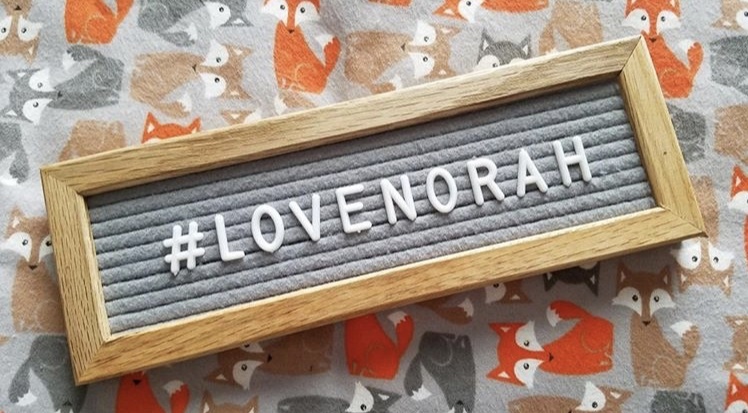 This simple T-shirt campaign has raised over $600 for Love, Norah! Those dollars will leave an impact on families that will last for a lifetime. We also started the hashtag #lovenorah for your birthday where we asked people to do one kind thing for themselves or others in honor of you and share it with us. The stories shared included everything from making blankets for the NICU, to shoveling snow, to helping jumpstart a stranger’s car. I think of each one of those acts of kindness as a little kiss you sent from heaven. Any parent hopes that their child will change the world for the better. Norah, you are doing that all the way from heaven and we couldn’t be more proud. Thank you for helping our aching hearts to grow. Thank you for showing us the impossible hope of the One who defeated death. Thank you for always being our fierce girl.